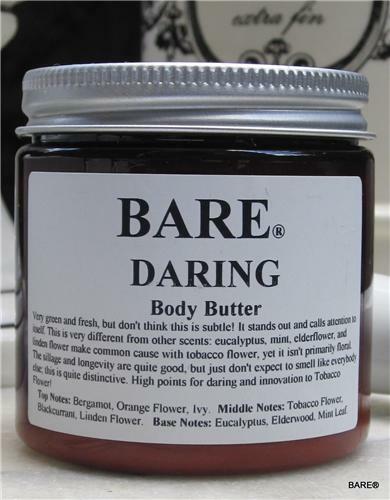 BARE "DARING"* Body Butter is a very green and fresh, but don't think this is subtle! It stands out and calls attention to itself. This is very different from other scents: eucalyptus, mint, elderflower, and linden flower make common cause with tobacco flower, yet it isn't primarily floral. The sillage and longevity are quite good, but just don't expect to smell like everybody else; this is quite distinctive. High points for "DARING" and innovation to Tobacco Flower! Top Notes Bergamot, Orange Flower, Ivy . Middle Notes Tobacco Flower, Blackcurrant, Linden Flower . Base Notes Eucalyptus, Elderwood, Mint Leaf.